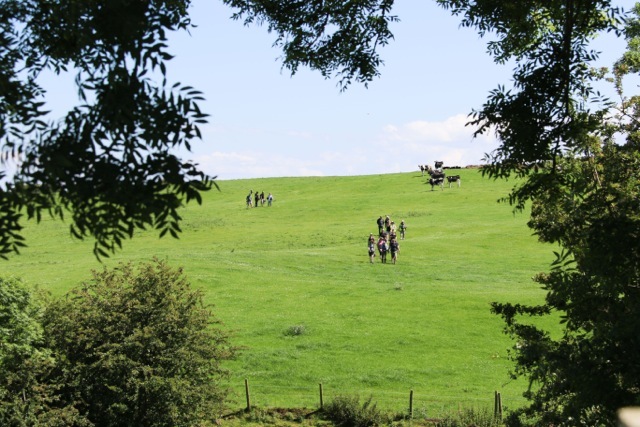 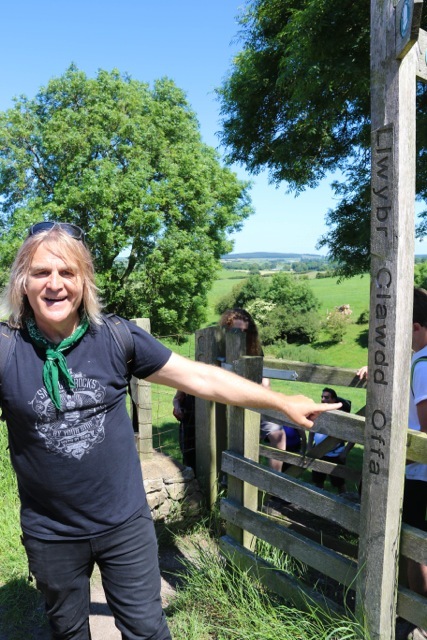 It was another glorious day in Wales as Day Four of the BY YOUR SIDE walk began at the Denbighshire village of Bodfari. 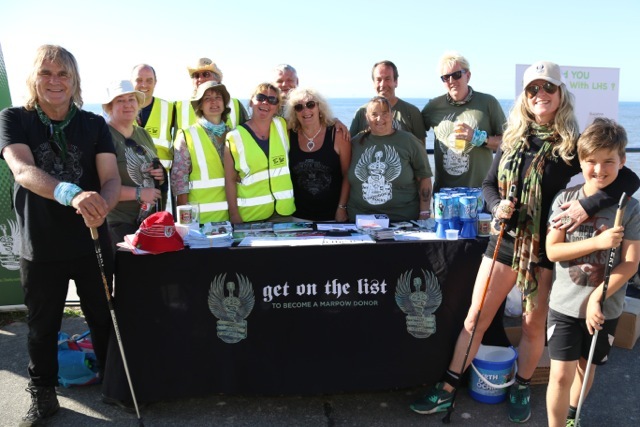 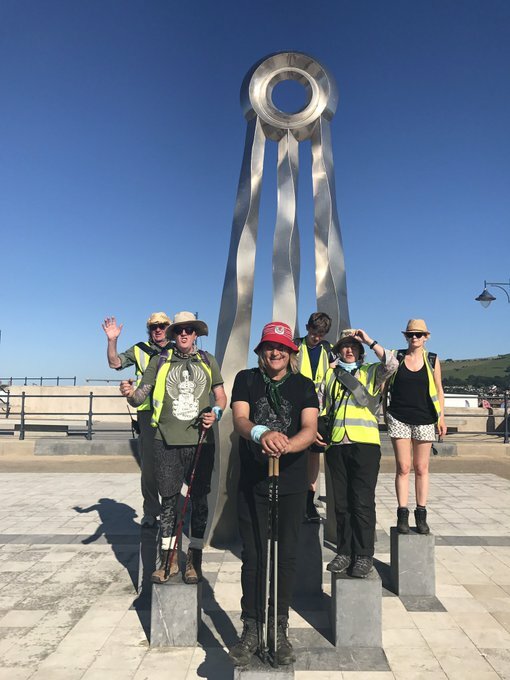 Another good turn out of people from all walks of life meant that a good day lay in store for all who had committed to the 18 mile hike to Prestatyn. 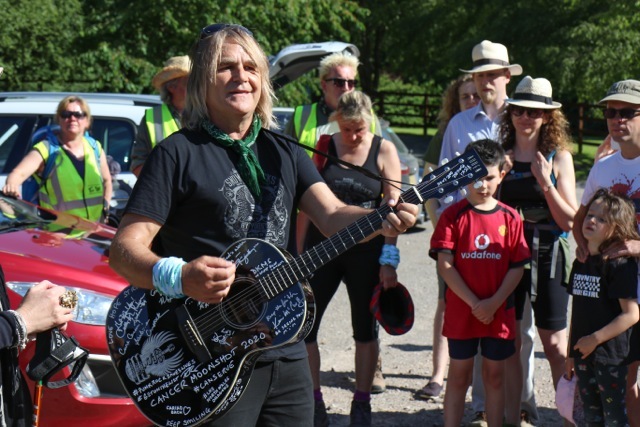 Chris Ruane, the locally re-elected MP for the Vale of Clwyd joined in at the start and Mike Peters pre-hike address acknowledged the importance of Chris’s personal support for advancing the “Get On The List in the UK’ campaign by setting up the first ever cheek swab donor drive in the House of Commons. 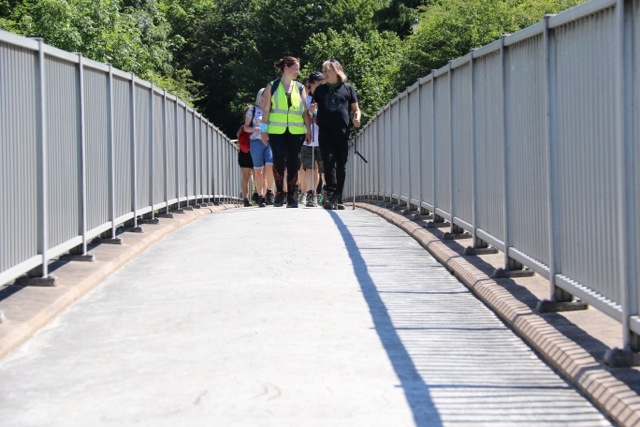 A drive that resulted in a life saving match via John Glen MP for Wiltshire. 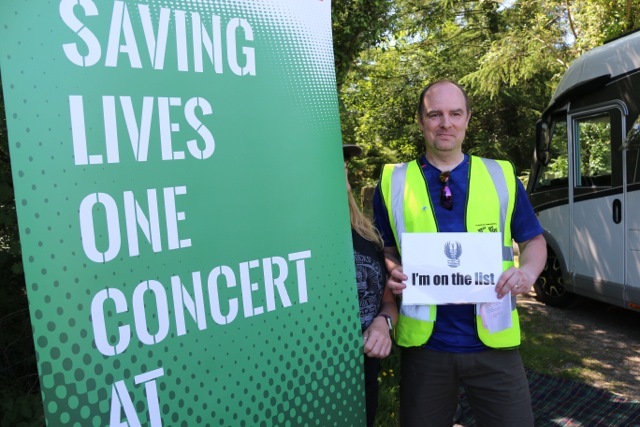 Mike’s lifelong friend Kevin Davies, who signed up and donated his lifeblood after coming to the Declaration Tour show at Manchester’s Deaf Institute in 2014, was also on hand to highlight the importance of the lifesaving aspect of the BY YOUR SIDE walk. 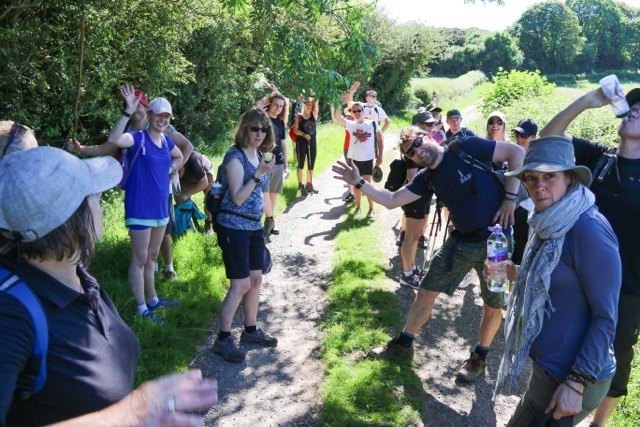 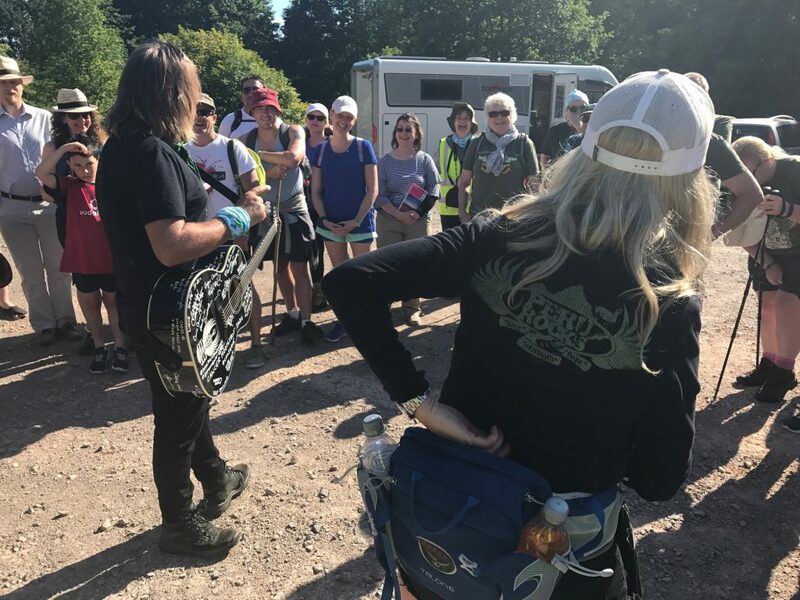 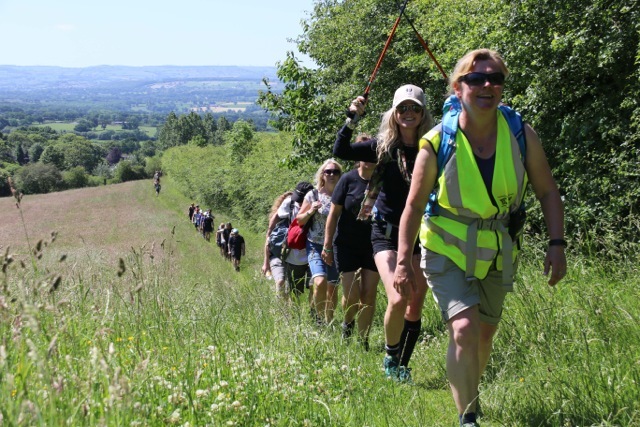 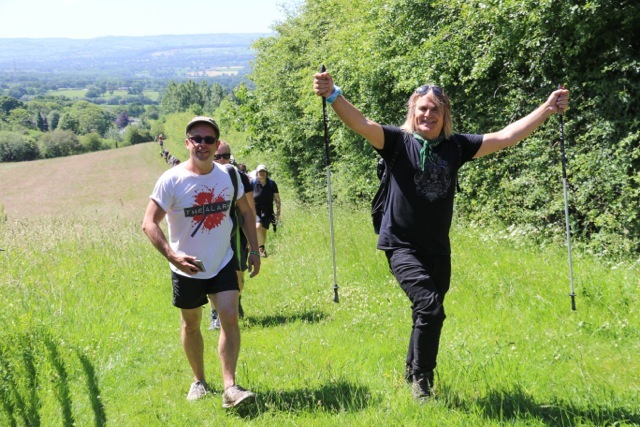 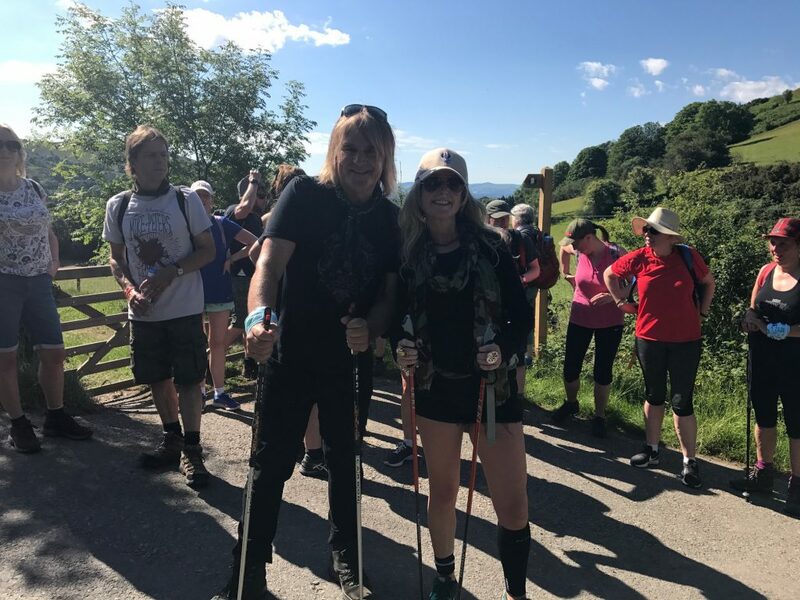 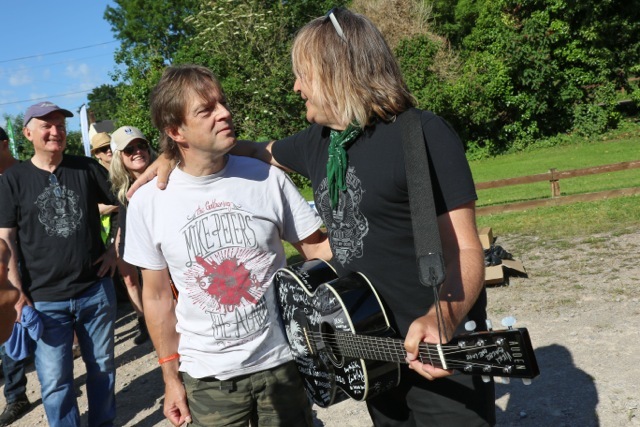 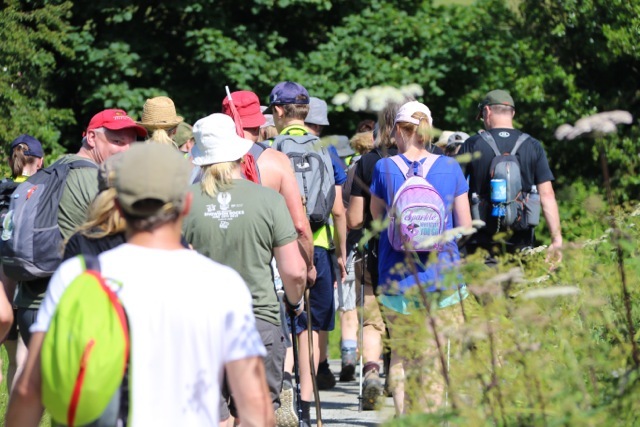 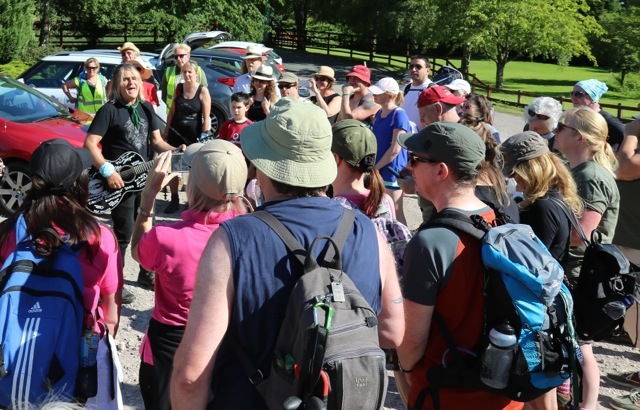 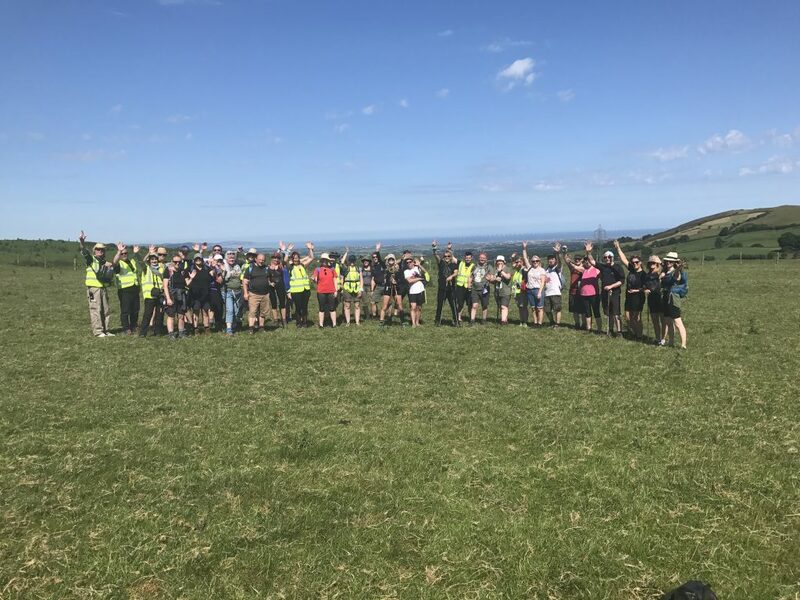 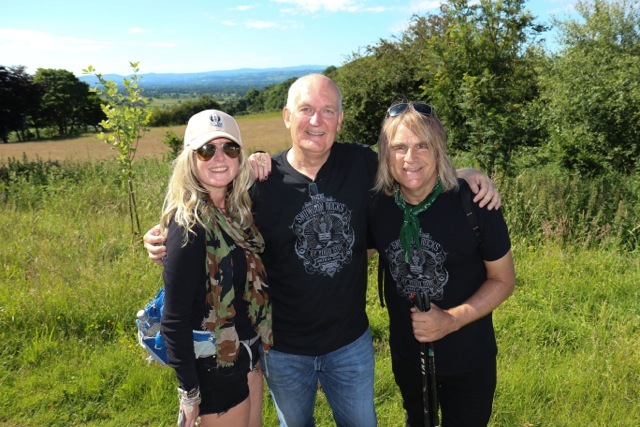 It was also Father’s Day throughout the world, and appropriately Mike Peters performed ‘Father To Son’ to set the walk on its way and upward in the general direction of the OFFA’S DYKE path. 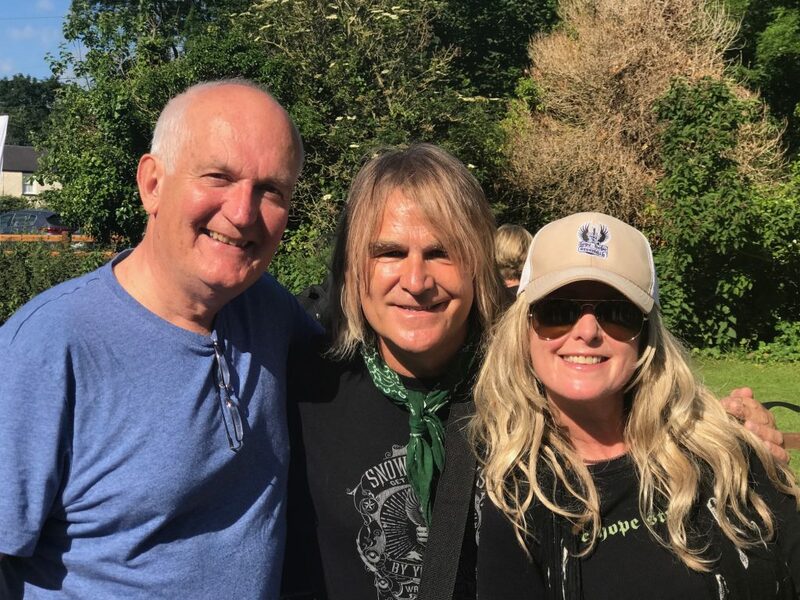 A BBC Songs of Praise production team were also in attendance to film a special program that would help to convey the Love Hope Strength message of Saving Lives One Concert At A Time to a national audience. 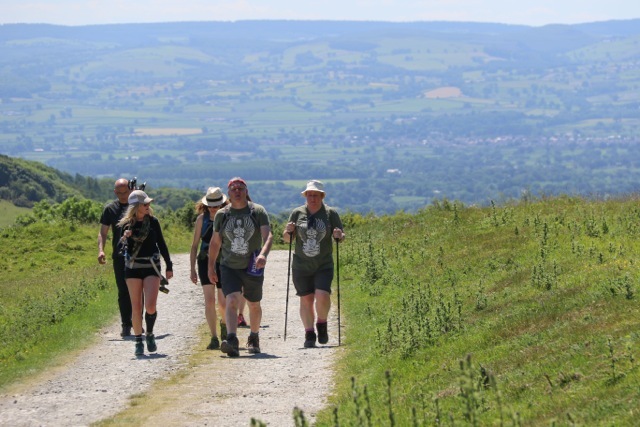 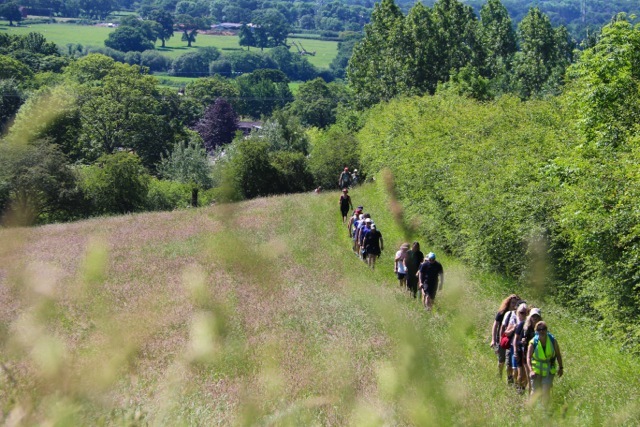 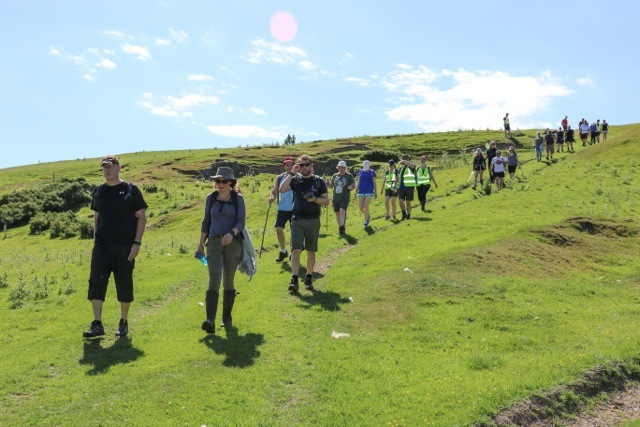 The first few steps of this trail turned out to be the hardest as the entire party worked its way up the very steep incline and onto the skyline walk that makes LLwybr Clawdd Offa / Offa’s Dyke such a challenging and historic walk. 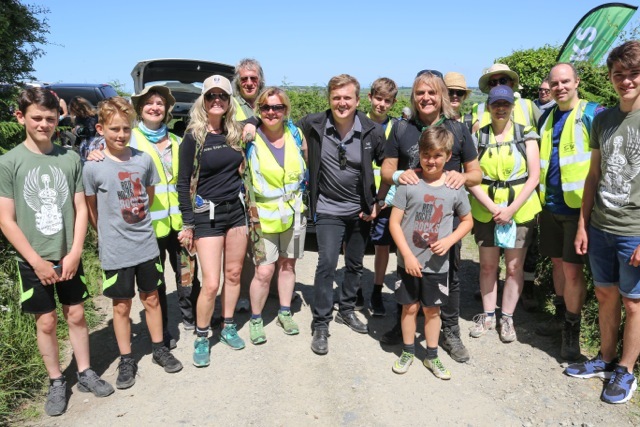 It was a scorching hot day and just dealing with the hike was hard enough, but with the BBC Songs of Praise production crew and directors in attendance to film, it meant a series of stop and start elements as the By Your Side team had to play the part of ‘Extras’ as Welsh presenter Aled Jones used his charm to convey the message of the day. 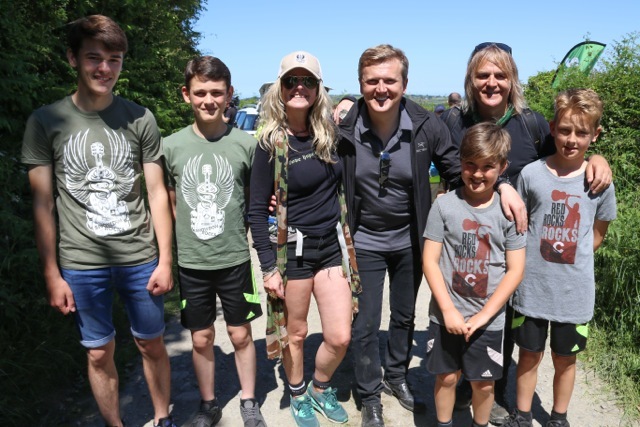 Aled – who is a British singing superstar and National TV presenter in his own right, was very personable and did his best to engage with every one on the trek, his light hearted and engaging personality struck a chord with everyone, and he even took a moment to ‘Get On The List’ himself. 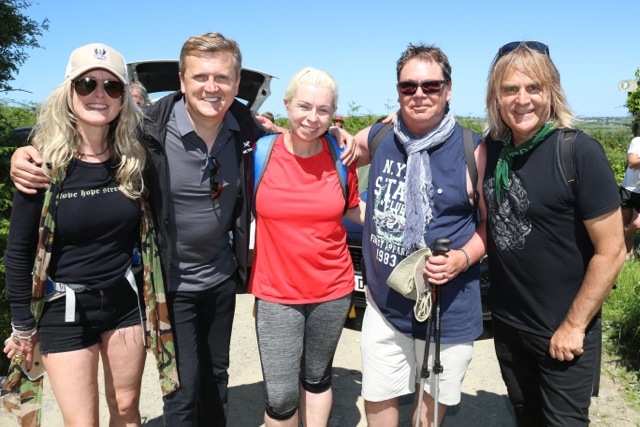 The exposure that todays walk will get on the BBC cannot be underestimated, and the fact that Aled Jones himself signed up to the registry, highlighting the fact that LHS / DKMS can sign people between the ages of 17 -55 in the UK, can only give more hope to thousands of families and potentially result in even more lives saved. 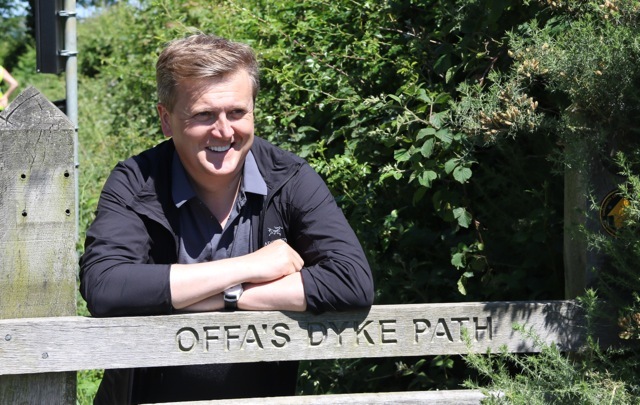 Thankyou Aled. 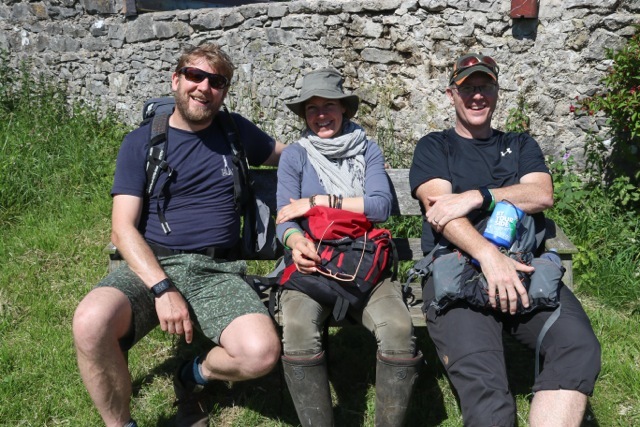 It was tough day for all concerned make no mistake, the inclines were brutal and the descents more so, but when you have volunteers like Simon and Mel Humphries (who followed the trek with a motorhome stacked full of refreshments and food bought at their own expense), doing their utmost to keep everyone going with sustenance, grace, humility and humour makes you realise how good it is to be alive. 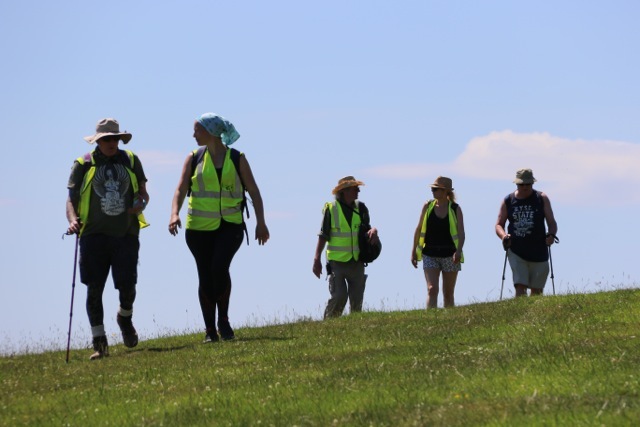 After lunch we headed into Marian Cwm, and as we climbed ever higher amongst the wheat fields, the lush green hillside views gave way to the vivid blues of the North Sea and, with a last goodbye to Aled Jones and the Songs Of Praise crew, the trail took everyone onto Prestatyn Mountainside and the end was finally in sight. 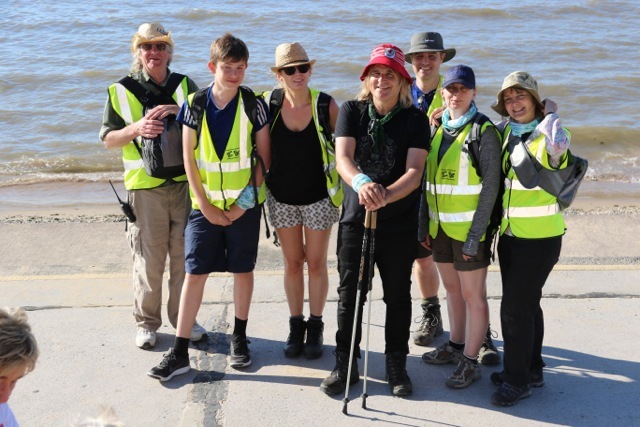 A fast and welcome descent through Prestatyn High Street soon saw everyone at shore’s edge on Barkby Beach and the welcome sight of the Beaches Hotel. 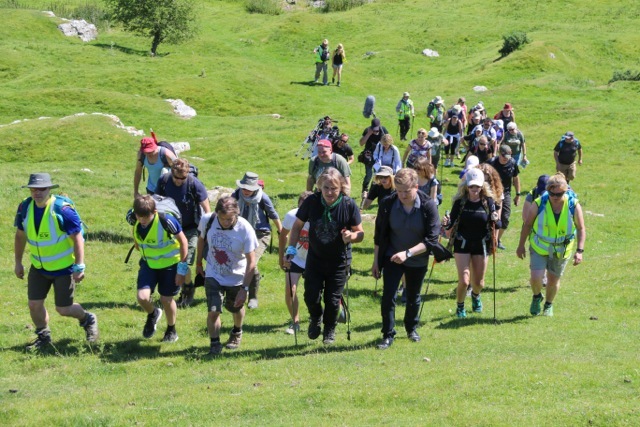 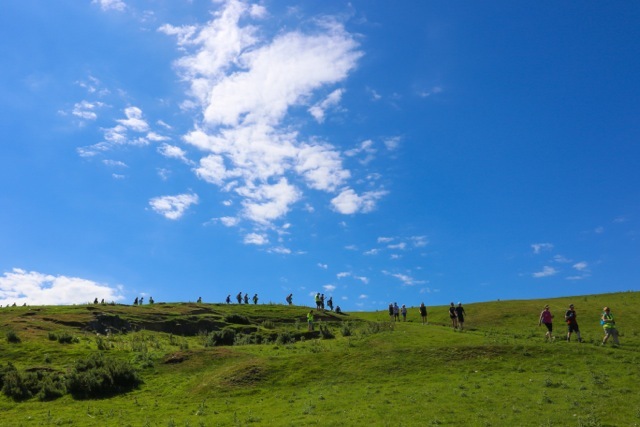 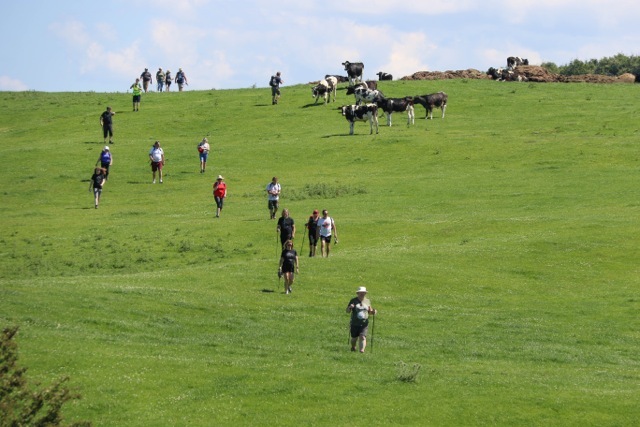 Ten hours of hiking in intense heat could not dampen the spirits of a group of tired but elated people, who all knew that with every step walked, a difference had been made. 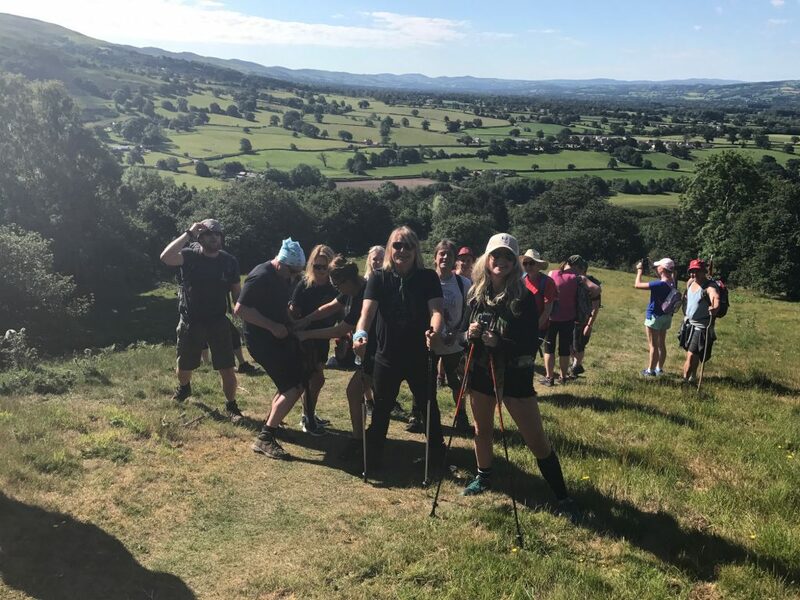 Unfortunately, Jules Peters was injured on one of the final hill descents when she fell on some uneven ground and severely sprained her ankle. 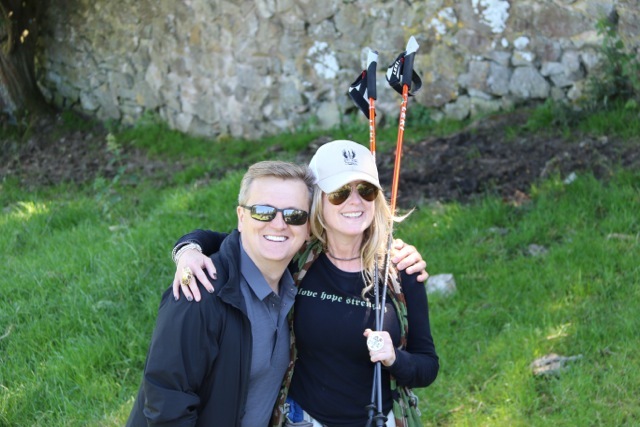 She was later admitted to A&E. 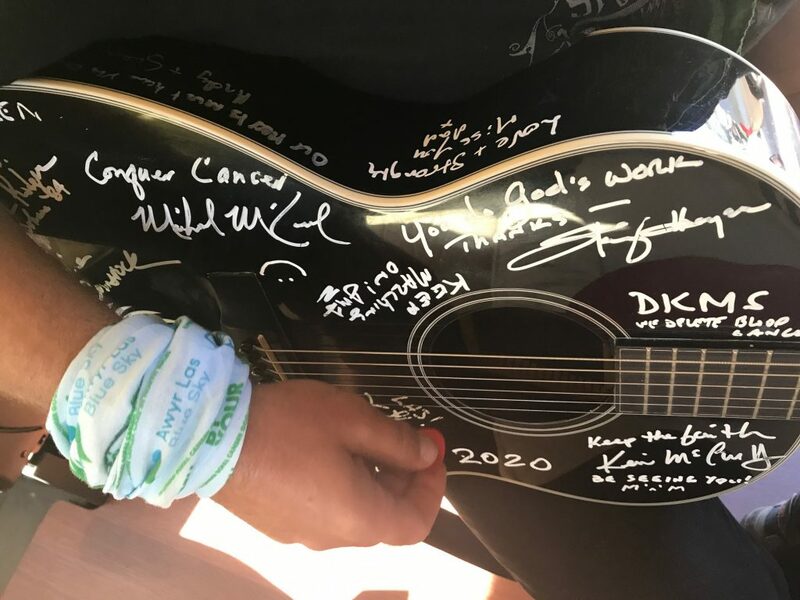 in the hospital and gamely made it back to cross the finish line with Mike and hopefully well enough to continue tomorrow. 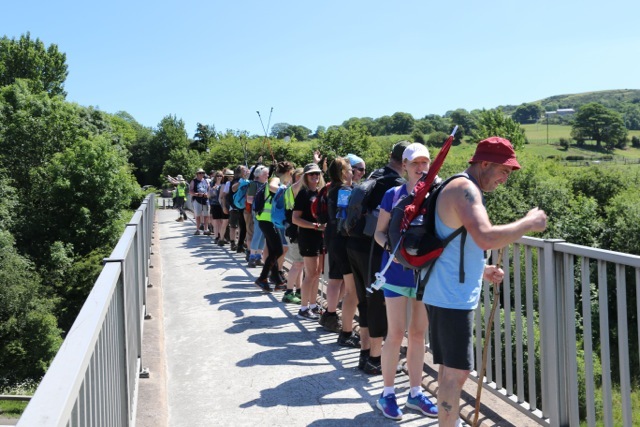 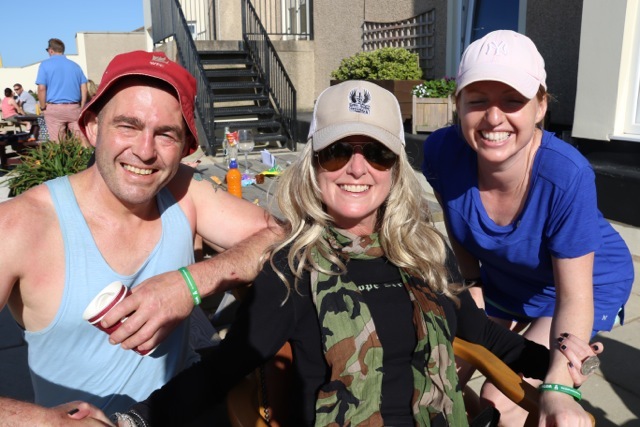 Day Five will take the By Your Side Walk from the North Wales Cancer Centre to Tre Mostyn, walking in the footsteps that Jules Peters left while hiking ten miles day through radiotherapy treatment.